Here at Aerosaurus, we are blessed to be surrounded with beautiful countryside right on our doorstep, and we love to show it off in all of its stunning glory to our passengers who join us on our highly-recommended Somerset balloon flights! We are lucky enough to have meeting locations in Taunton and Castle Cary for our hot air balloon rides over Somerset for your convenience. With the ballooning season upon us, the flight team at Aerosaurus Balloons want to make your hot air balloon experience one to remember, so take a look at our spotlight on Somerset balloon flights and see where your airborne adventure takes you this year. When you think of a Somerset balloon flight, what comes to mind? Rolling landscapes of outstanding natural beauty? Architectural elegance in the way of historic buildings and monuments? Luckily, when you choose a flight meeting point in Taunton, you will be able to see both of those and so much more! Taunton balloon flights enable you to view the scenery below from a panoramic perspective. Both of our Somerset balloon flights allow nature-lovers to fully immerse themselves in the beauty of the Somerset hills and countryside, but our Taunton flight vouchers will cover land, lakes and rivers for a truly extraordinary balloon flight experience. 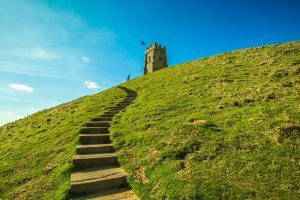 Synonymous with rock bands and international popstars, Glastonbury is a town in a league of its own here in the UK. When not welcoming headline stars, this picturesque part of Somerset is a sight to behold and you can view all of it and more from the basket of your hot air balloon. The pilots and crew here at Aerosaurus Balloons are experts in their industry. With years worth of experience and knowledge of Somerset, you won’t find a friendlier team of balloon enthusiasts in the South West. For more information about our flight availability and other UK flight locations across the region, get in touch with our advisable staff who are on hand to make your adventure with us one which you’ll never forget!